A couple of years ago, I swore off Foundry figures, they were expensive and a regimental order of légére showed up from Nottingham with more broken bayonets and plumes than I could count. 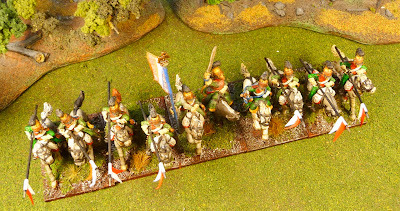 There was also the major problem of their cavalry, they are tiny in comparison to other manufacturers especially Front Rank or Calpe. Even Perry's are quite a bit larger. I do, however, have a couple units of Foundry cavalry that I painted more then 3-4 years ago. 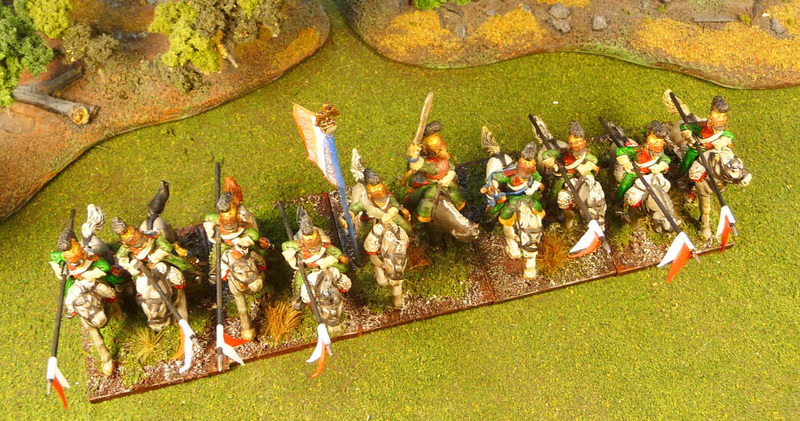 I have been recently expanding my cavalry units and this unit and some Foundry guard chasseurs only had 6 figures and I want at least 12 in each unit. Two or 3 years ago, I bought 2 packs of Foundry Mameluks to add to the guard chasseurs, I have yet to paint these. The only problem with this is that the other units in my guard cavalry brigade are Front Rank and they tower over the Foundry figures. Not much I can do about it now, I do try to plan my long term painting in brigades. With the recent decision of Foundry to reasonably price their figures to the ROW, I am going to reconsider some of my purchases. Although Foundry figures are not on high on my preference ranking, they are nice figures. I recently found out that they have some British infantry in greatcoat, and as I am trying to expand my armies these are attractive as they would be quick to paint. I also need a couple of elite company lanciers to add to the 4eme regiment. I suppose what I have to think about is should I use only Foundry's for a planned lancier brigade? Plans.....plans.....decisions......decisions. I believe that the figures on each end are the ones I have just painted. I did extensive touch ups to the old figures, my painting was very rudimentary at the times. Even used black primer! Still invert the pennons occasionally, I could not get them off to reverse them. I've been very pleased to see the change of course at Foundry - they've even brought some of their War of 1812 lines which are very good. Ha! I see we're having a bit of sychronicity with painting lancers. Very nice work, John. 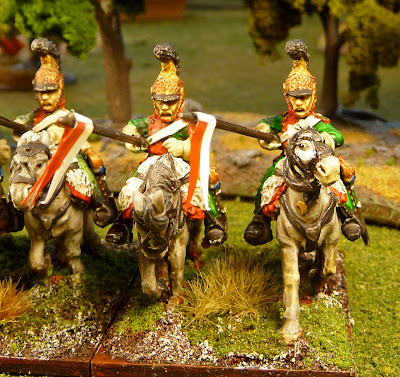 Even though it seems unfashionable, I still really like the Foundry range of Napoleonics (the Perry sculpts, of course). As long as you don't mix figures within an inf battalion/ cav regiment they work in really well with other manufacturers (imo). I think they look great! I also really enjoy the Foundry Nap range quite a bit! The new pricing and customer policies have put Foundry back on my scope as well! These dogs are most likely from a puppy mill or a backyard breeder and have not been tested for genetic health defects and will most likely not be registered. [url=http://www.2012canadagoosepascher.fr]Canada Goose Pas Cher[/url] so there you go. I watched in amazementas the bird walked across the streetback to my house and to the snow-bank. Try the Lower Cervical/Upper Thoracic stretch. But the state, of course, wants to keep this large influx of environmental and wildlife watchingrevenue flooding into the general funds for ordinary state spending.. [url=http://officialcanadagoosesoutlet.ca]canada goose whistler parka[/url] CMIGS cautions investors about investing in platinum when prices are high relative to gold.. Beneath a depiction of a centaur trampling an enemy is a frieze featuring swastikas. It was not until the 17th Century that the rigid demarcation between the two foods began to break down, and oysters began to be cooked with roast capon or duck.